When you bring up the name Sigmund Freud, the father of psychology, everyone has an opinion. Well today I am going to tell you a story about Freud that may leave you thinking about him in a different way. One day, Dr. Freud decided to purchase an Alsatian shepherd named Wolf for his daughter Anna. He wanted her to take the dog on her evening walks through Vienna for protection. As it often happens with cute dogs, Freud fell in love with Wolf. A few years later, he received two red chows. Now in his 70’s Dr. Freud became very close to one of the chows named Jofi. It wasn’t long before Dr. Freud began bringing him to sessions with his patients. Initially, Freud, a shy man brought Jofi to the sessions to keep himself calm. Over time, he noticed that Jofi calmed the patients as well and that they became more open in the sessions when Jofi was present. Sadly, Jofi died in 1937. By this time the war had started and Freud and his family had to flee Vienna for London to escape the Nazis. After settling in England, Dr. Freud got another chow named Lun and continued to welcome his dog into his personal life and sessions with patients. After years of dealing with patient’s suffering and living through two World Wars, Freud took refuge in the simplicity of being a dog person. 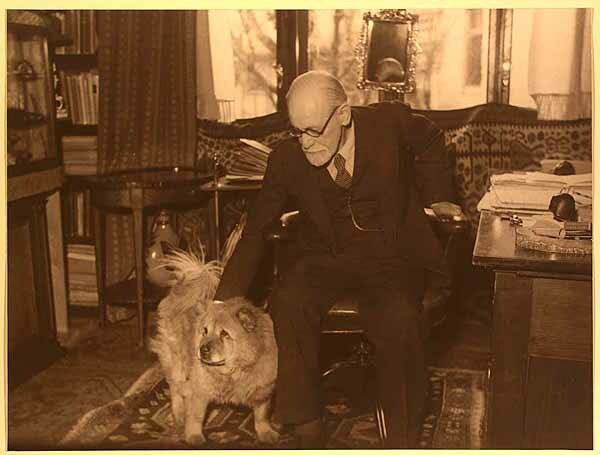 When I heard this story about Sigmund Freud, I wondered if he could ever have imagined what he started by bringing a dog into the therapy sessions. I think he would be happy to see how the work of dogs has evolved and how all animals help to heal, calm and bring joy when doing therapy work. Freud once wrote” It really explains why one can love an animal like Jofi with such extraordinary intensity: affection without ambivalence, the simplicity of life free from the most unbearable conflicts of civilization, the beauty of an existence complete in itself.” Thanks to Dr. Freud and his dogs, there is a Grover and Doc today. It’s spring and that means it’s time for the Canadian geese to return to their place of birth on the pond behind Doc’s house as they do year after year. Two geese that Doc has named Max and Myrtle scout out a place to make their nest and then they settle in and wait for the happy event to occur. Even though I am part bird dog, I know not to mess with those geese. We live in harmony, or at least we did until the other day. It was one of those perfect sunny days. Spring flowers were blooming and a slight breeze was blowing through the trees. Max was staying near Myrtle his life long baby mama and I was keeping watch while resting in the sun. 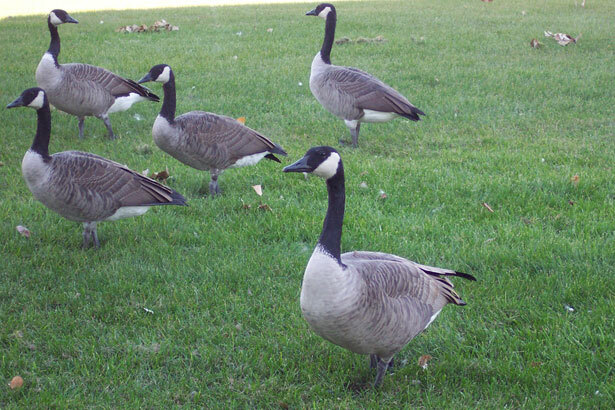 Suddenly, I was startled to attention by a loud ” HONK, HONK!” A strange pair of geese had landed by the pond. Before I could even react, it was on! Max came charging toward the pair, flailing his 60 inch wing span and head butting the pair like a scene from the Jerry Springer show. Those interlopers couldn’t fly away fast enough. The funny thing was, that after the geese flew away, Max went right back to Myrtle’s side like nothing had happened. 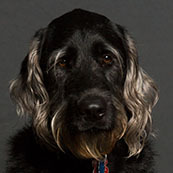 Doc often tells me that her favorite thing about all the creatures in nature is the way we deal with problems. Unlike humans, we address the problem and then move on. There are no grudges or long-term drama. Life is just easier that way. In the wild, we have to move on for the sake of survival. I watch you humans worry your lives away. And that my friends is why humans get ulcers and animals don’t. Doc and I are early risers during the work week. She lets me out a 5am and everything usually goes like clockwork, that is, until this morning. I alerted Doc to the problem with a low growl and that got her attention right away. There was something moving in the grass in the back yard and it wouldn’t leave. I didn’t want to act like I was scared, but I was. Doc turned on the porch light so she could see. She didn’t miss a beat. She charged out the back door in her pajamas, bed head blowing in the wind. As she closed in on the terrible beast, at first it wouldn’t budge, but Doc stomped her feet and waved her hands until the beast hopped away through the wooden slats of the fence. 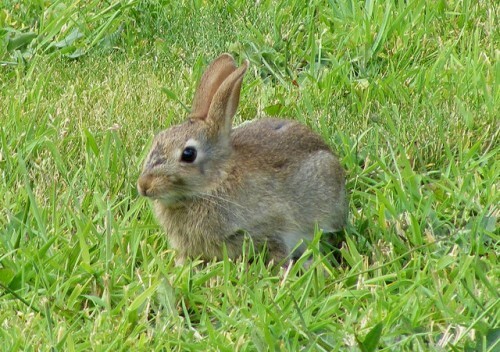 As it turned out, the monster was a baby bunny. Feeling safe, I went on about my morning routine and Doc went back in the house. The best thing about the whole adventure is that I learned that I can always count on Doc. She never made fun of me for being scared, she just took care of business. Doc thinks it’s no big deal, that everyone is afraid of something. But, it’s just so nice to have someone to scare the monsters away without making you feel bad for being afraid.